It may look strange to exhibit something that is not so close to the academic art, but the O3ONE gallery is avant-garde and informal enough to aaccept such the experiment. One of possible titles for this exhibition was "Idle constructor", but I opted for a variant closer to non-technical oriented visitors. It was hard to abandon that title, because it makes us think about what could someone, who is in love with digital electronics, do in the years of war and crisis, when hardly anyone had anything but violence, money, weapons or pure survival in his mind. So, what could the idle constructor do while no one needs his service or cooperation? Maybe he could surround himself by four walls and build things like this. 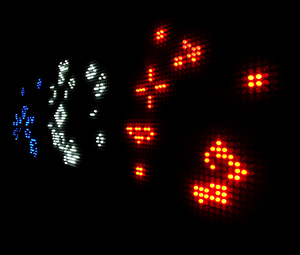 A triptych of substantially identical, but different colored matrix of 40 × 40 LED's, where the constant chaos of creating and evolving recognizable forms, in accordance with an algorithm designed in 1970. by John Conway, named Game of Life (en.wikipedia.org/wiki/Conways_Game_of_Life) and presented in the magazine Scientific American. The algorithm is as follows: each cell (or each LED in this case) may be "alive" (on) or "dead" (off). Each cell (except at the edges of table) is surrounded by 8 neighbors, so if there are two living neighbors, its status will not change. If there of the neighbors are alive, that cell will be alive in the next generation, and if there are less than two, or more than three, it will die as lonely or stifled. And that's all. Following these simple rules, the initial chaos slowly becomes self-organized and inhabited by various organisms. I first met this "game for zero players" 1975, when the BYTE magazine descrobed this bright idea. There were no microcomputers then (or at least I did not know about them), but the algorithm fascinated me so much that I randomly simulated the "chaos" on the paper, and manually, using nothing but pencil, generated the hundreds of Life matrices in my math notebook. The next year, when the first Z80 microprocessor appeared on the market, my first project was ... guess what. I still had no computer, so I assembled the program manually, using (maybe the same) pencil and notebook. I programmed my first 2708 EPROM byte-by-byte, using my DIY programmer which looked like a bunch of wires, but the Game of Life with 16 × 16 LED matrix worked for many years on my wall. My only modification to the original algorithm was the subroutine which recognizes a stable patterns on the matrix, and enters some random mutations... well, nature does the same thing. So it works forever, never repeating the same pattern. You shall never find the better decoration for your wall. The digital clock must not have the square form - this is bent as a pancake. This is actualy a paraphrase of Dali's painting "Persistence of Memory", which some critics have argued that was inspired by Einstein's special theory of relativity, but they were denied when Dali said that it was inspired by Camembert cheese melting in the sun. 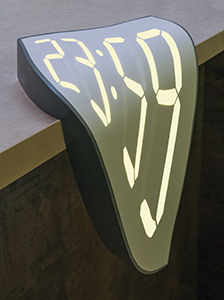 This digital clock, however, is not made of cheese but hard material called vitroplast (fiberglass reinforced epoxy laminate) with the thin layer of copper, used in printed circuit boards technology. The digit segments on the front plate were processed by ferichloride, so the material remained transparent. If there is Salvador Dali, why not Piet Mondrian also? 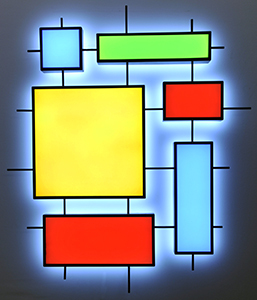 His famous rectangles are often used in architecture and furniture design, but they are very suitable to be illuminated by LEDs, as Mondrian used pure colours only: red, blue, yellow, white, black and sometimes gray. He never used green, but... (you don't mind a joke, do you?) what does Mondrian know about RGB model? Although it seems simple, the realization of this lamp needs a lot of effort and time. The easiest was to set the LED strips in color as light sources for illumination, but it is not so easy to conduct the voltage to physically separated areas, so that conductors are not visible and that they do not cast shadows to large diffuse surfaces on the front. When I was a kid, I used to build kites and wait for windy days to have fun. As a man of my age can not fool around that way, I found an excuse to make another kite, as a wall lamp. 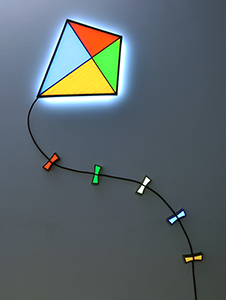 It is technologically similar to the previous lamp, but has a long tail (actually a thick cord, used for voltage supply) with "ribbons" that the real kites normally use for flight stabilization. At the first glance, it is hard to say that this is the clock, but the real hacker shall easy decode the displayed time. 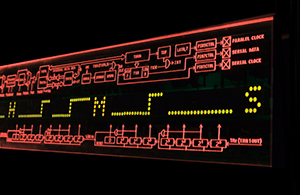 The waveforms are similar to digital analyzer output, and they code the clock digits in binary (specifically BCD) code. Some bugs are periodicaly simulated, so those waveforms whistle, curl, curve, warp, then for a moment write the decimal numbers ... and even in plain text. Just enough to confuse observers, and then again return to "those awful waveforms." In the same time, the colour of the environment is also changed, so this clock is never in the steady state. It is actually a story about the hardware. 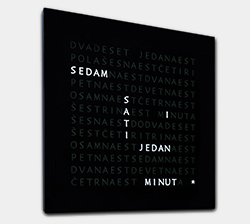 I found the idea for this clock somewhere on the internet, so I just "localized" it. To achieve a better optimization of the character matrix, some characters are used for various words, sometimes even vertically, like in crosswords, and sometimes in the specific, but correct jargon ("half eleven", "seven minutes to four," and so). The time resolution is one minute. After about two years year of using the clock on the wall of my room, I noticed that it influenced the way that I perceive the time. Not like the arithmetic or geometric concept, but something expressed in a more intimate way. I don't know whether it is good or bad, but it is certanly unusual. Although it seems to be the LED matrix located at the upper surface of the table, it is on the bottom and spreads in all directions to infinity. 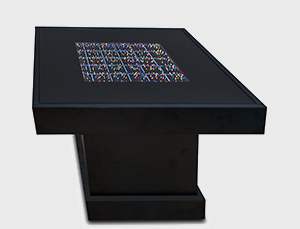 There are only 9 LED areas with with white bordered squares at the bottom of the table, but there are four mirrors on the walls, inside the table. No matter where you are and how you look through the glass, you always see endless colorful "carpet", which is not static, but each LED slowly and randomly goes on and off, so it creates the impression of constant fluctuations. There were more projects at an exhibition, and all of them were the product of my "mental hygiene", some kind of therapy when I needed to create something, and there was no other thing to do. That is the only reason, just to make me feel good. The only trouble was when the exhibition manager asked me to write my CV, which will be attached to the announcement of the exhibition on O3ONE's website. I do not have a formal impressive resume, and I was defeated when I read the biographies of some past exhibitors - Number of exhibitions, awards, ... In the end I gave up trying to introduce myself falsely, so I boldly described the failure of all my attempts to enroll in secondary school of electrical engineering and the Faculty of Electrical Engineering, and ended up: "I am not the bearer of social recognition. I have never participated in exhibitions nor am I rewarded. I have no patents. I have never been a member of the art associations, political parties or any stakeholder in the field of art. Never perform as an artist. None of the exhibits were never made by order, material gain or desire to enter the market. The sole purpose of the effort invested was the pure personal satisfaction."